Graffiti art is when text and images are drawn or spray painted onto walls and surfaces, usually in urban, public places and normally without permission. The notion of drawing words and images on to walls is not a modern one and can be dated back to Ancient Greece and the Roman Empire. Graffiti art was born in 1970s New York, when young people started to use spray paints to cover walls of buildings and the sides of subway carriages. Graffiti art has many variations, from the stylised graphic imagery known as wildstyle to boldly aesthetic ciphers, which are referred to as tags and are unique to each artist. Graffiti, since it is executed in public spaces, on property that does not belong to the graffiti artist, is sometimes considered as vandalism. Because of the urban setting and the idea of defacing public or private property, Graffiti art often intends to explore political and social questions. Street Art and Graffiti are two terms that often go hand in hand since both take part in the public arena, yet Street art is a far looser identifier in terms of style and media. Contemporary graffiti art is fairly narrow in its self identification and centres on the concept of tagging on on a text-bases aesthetic, while Street art extends to a wide range of media, from stencils to video projections. Although somewhat confined in terms of categorisation, Graffiti art has a huge range of stylistic expression and techniques. The initial graffiti form is the tag, which is essentially the name of the artist but written in a highly stylised way. A Throw-Up is more complicated and elaborates on the tag, adding more colours and more complicated forms. As Graffiti art grew, it came to transcend lettering and incorporated abstract and figurative compositions to accompany the text, something which has a role to play in its eventual commercial success. 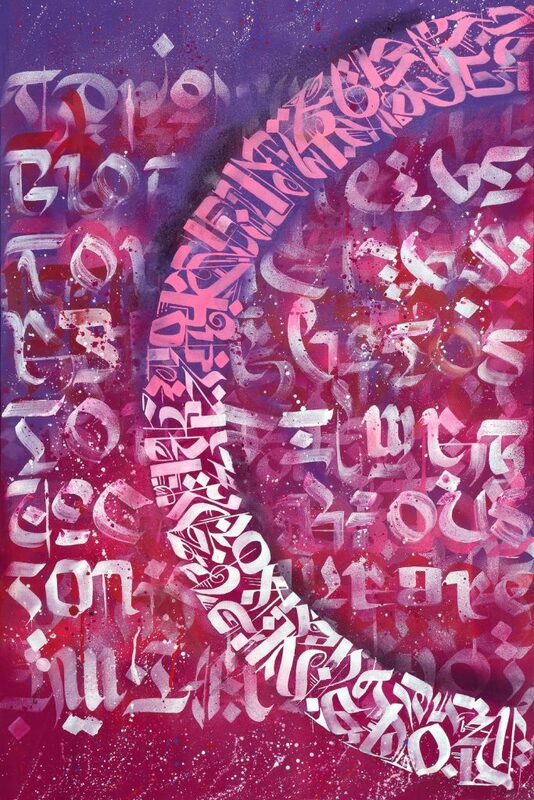 Wildstyle and Bubble are terms used to describe more complex aerosol paintings that are difficult to read and resemble abstract compositions of interlocked forms and letters. Occasionally artists will choose to work with brushes in order to create a more painterly touch to the imagery. Abstract art also became influential in the graffiti scene, where artists focused primarily on the pure aestheticism of the piece, combining color, shape and line to create a visually balanced composition. The graffiti style has become a world popular subculture that has seen names like Banksy and Blek le Rat reach global recognition with their stencil style Street art. Stencils or cutouts are made in the studio and then sprayed over onto walls to create the image and because of their reproducibility have helped in making the works of Banksy world-famous. Graffiti in its truest form is very rarely exhibited within the walls of traditional art institutions although the style, tags and graphic motifs have inspired many modern and contemporary artists. The canvases of Jean-Michel Basquiat and Keith Haring which hang in some of the world’s most prestigious museums, such as the MoMA, are hugely inspired by the graffiti scene. In more recent years, with the popularity and intrigue for Graffiti art growing, a number of artists, such as Banksy, have presented their installations or graffiti canvases within a commercial gallery setting. This increase in popularity for urban culture and street art has seen many traditional graffiti artists combining their street style and techniques with more studio-based, canvas works. Graffiti, especially in the past twenty years, has managed to shake off its association with vandalism and public defacement and has entered the realm of high art. While some of the original New York graffiti artists of the 70s such as Lady Pink, Crash and Daze were able to cross into the commercial gallery scene, it is only now that this combination of street and studio style is becoming common practice. 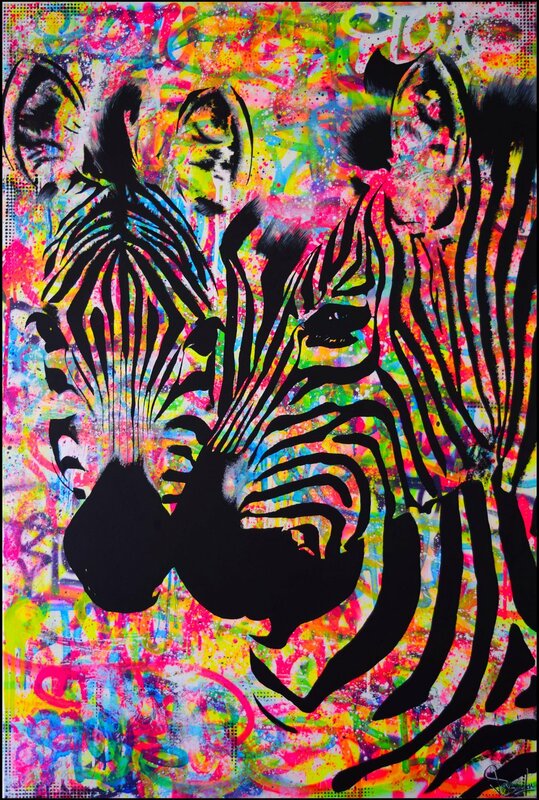 Singulart represents many graffiti artists who have taken to the studio with their spray cans to create exciting graffiti-inspired paintings on canvas. The French artist Vincent Bardou uses acrylics to paint images from popular culture over an intricate interlating of aerosol writing, combining a figurative style with an urban street inspired one. American artist, Muhammad Zaman, on the other hand, focuses on a purely text-based aesthetic. Discover the varied use of graffiti with original paintings and mixed-media works on Singulart.